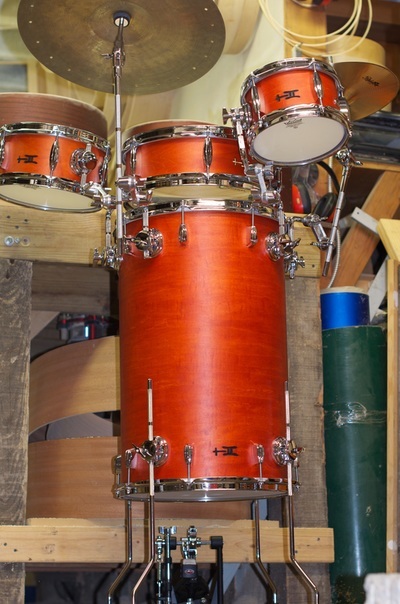 These fun drums heralded a first for TreeHouse Custom Drums: a drumset whose price includes hardware. Really, who has a pedal laying around that shoots up? 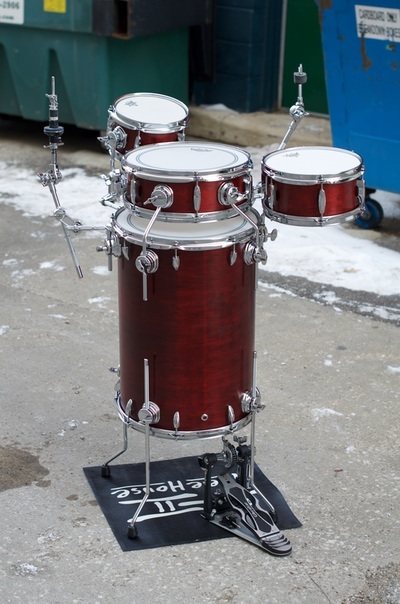 These great kits include all the arms and brackets you need to attach two toms, a snare, a pair of hi hats, and a cymbal to the bass shell, as well an up-firing pedal. 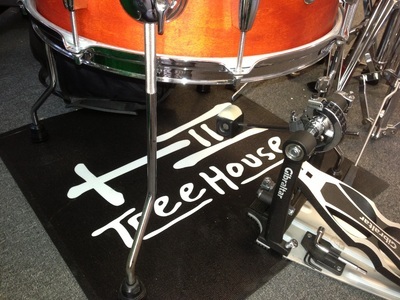 Just for kicks (no pun), we’ll throw in a great TreeHouse rug to keep your pedal in place. Cocktail kits have been around for over 65 years. They were tall 16” floor toms with snare wires inside the upper head. Then tall 14” floor toms showed up with separate 14” snare drums hovering above them. Both of these ideas were interesting, but rather impracticable considering how much snare buzz you got from playing the bass. Next came an idea that’s become quite popular--a wee snare on the side. Ballads and brushes just aren’t so well suited to 10” snares, though. Lots of varieties on the theme include a side tom, some cymbals here-n-there, etc, all designed to give the player a compact instrument that is played while standing. Enter TreeHouse’s version. First off, notice how a separate snare hovers over the bass, but check out the sizing: a 15” bass with a 13” snare offset over the bass. 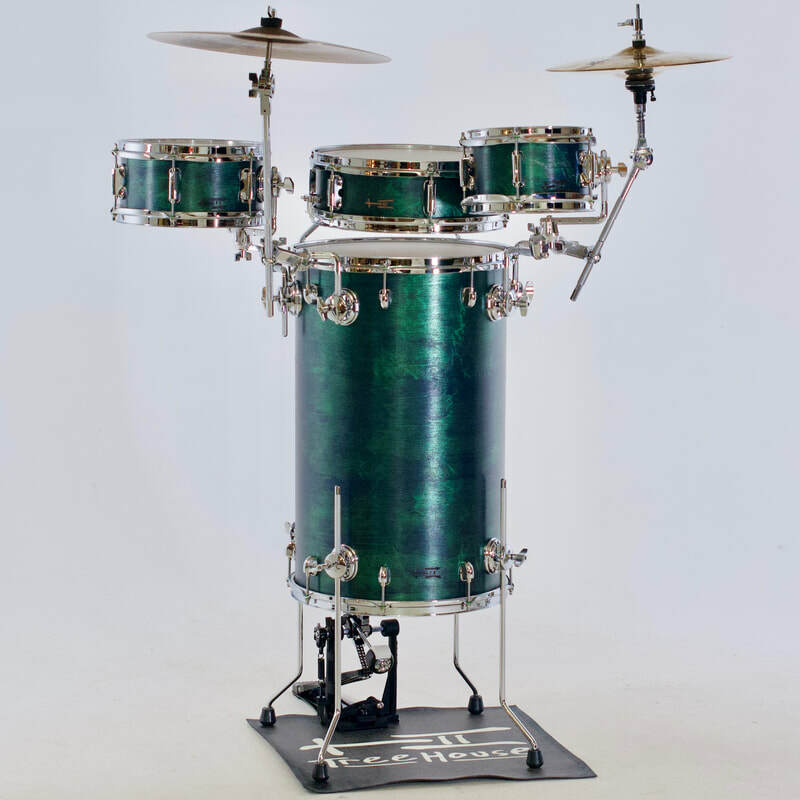 The idea was to maximize playability, sound quality and efficiency of space while minimizing snare buzz. An experiment. To knock out even more sympathetic snare wire vibration, you could swing the snare around off of the bass for a more traditional 5-pc approach using the top of the bass as a floor tom. Next come the toms. The standard offering includes an 8” mounted tom and a 10” mounted tom. 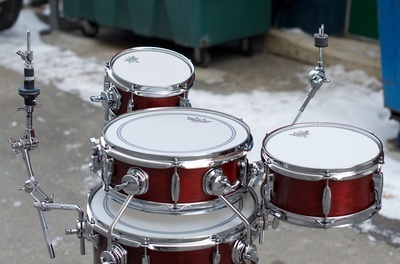 What you don’t see from the outside is the effort to make these two near-sized drums sound as far apart from each other as possible: the 8” has a thick (10-ply) shell with sharp bearing edges and single-ply heads while the 10” has a thin (6-ply) shell with rounded bearing edges and double-ply heads. Another experiment. Survey says: They Worked! The buzz is still there, but tolerable and--in context with a band--pretty unnoticeable. The toms sound far apart from each other and have serious sustain. Added in is some great adjustable Gibraltar hardware so now you’re ready to sound great on the tiniest of stages!